Something I can always count on, regardless of the holiday, is that my family will play a card game. I hope that playing cards remain a tradition in our family because it's such a relaxing, funny, and different interaction that technology cannot replace. 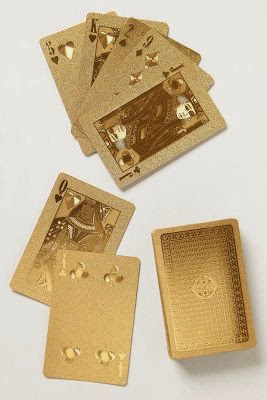 I found these Gold-Dipped Playing Cards from Anthropologie and I am obsessed. I think these are the perfect gift for the person on your list who loves cards, gold, and some sparkle. I'm headed to South Carolina to spend Thanksgiving with my family and I cannot wait. I love going to S.C. every year (and not just because of the food). Do you have a family tradition that happens at the holidays? Have you entered my Starbucks holiday giveaway yet? Those are really nice! Enjoy your trip. I saw those on pinterest a few days ago! I love how those cards look! Those are awesome! They would make a great stocking stuffer for a poker fan! I love these cards ! They are so perfect!